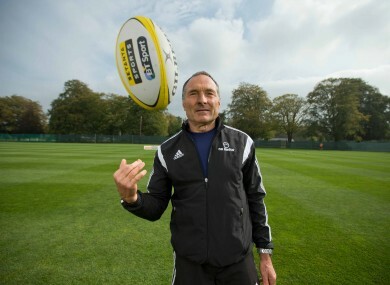 TheScore.ie spoke to the man many consider to be the best kicking coach in rugby. Dave Alred carried out the Setanta Sports Kicking Clinic last week in Carton House. It’s quite an admission from the man many in rugby consider to be the best kicking coach in the world. Dave Alred has helped England to World Cup success, coached the Lions on three tours and worked with numerous clubs and individuals – most notably Jonny Wilkinson – to improve their kicking and ability to perform under pressure. Johnny Sexton is currently benefiting from Alred’s services, while Paddy Jackson, Rhys Patchell of the Cardiff Blues and English international George Ford also learn from the Englishman. These place-kickers come under some of the most intense pressure in the sport, given their individual duty of converting crucial chances from the tee. How does Alred help them to prepare for that task? Performing under pressure is highly desirable, but re-creating the pressure of a last-minute place-kick in a vital rugby match must be difficult on the training ground? Given that Alred has a PhD in Performing under Pressure from Loughborough University, he’s well place to answer. If you say that often people’s response to pressure is anxiety, there are actually quite a lot of ways you can create anxiety within practice,” says Alred. “For example, let’s look at goal-kicking – I have this thing called the ‘Six Red’ and, basically, if they miss one of six kicks in the red zone [usually an area within the two 15-metre lines and 35 metres or so from goal], they start again. “There are other things I do that make things quite pressurised, like doing sequence kicking, where they have to do one drop-kick to a certain area, or one spiral to a certain area, etc.. If they miss, they have to start the sequence again and they have to get a complete run of success. Alred admits that some of the mental skills involved in goal-kicking can be improved away from the pitch, “in terms of trying to work out the right self-talk to motivate yourself,” but stresses the importance of practicing in the environment where the kicks will take place. Alred feels fortunate to be working with four strong goal-kickers at present, but his work is not simply restricted to rugby. Rugby league, golf, judo, football and Aussie rules have all taken advantage of Alred’s expertise. Every one of those seemingly separate strands feeds into his coaching in rugby. “The variety is fantastic, because mentally it really does challenge you. Understanding the thinking behind what people are doing is priceless. That’s why I really do like looking at other sports, and getting really involved in it, like I did with Aussie rules and British judo. Many people will judge Alred’s work, and the ability of his kickers, on the cold, hard data of kicking percentages. Is Johnny Sexton over 80% for the season? Did George Ford only kicked four out of seven last weekend? The answers to such questions simply don’t paint the full picture, explains Alred. “No, not at all. First of all, I hate the raw data. I know it’s very comfortable for the press to say, ‘He kicked six out of eight.’ Rhys Patchell missed two kicks one weekend recently, but the crucial thing for me was that he didn’t miss one kick in the red zone. All those basic kicks that you’re expected to get, he got. He missed one from 57 metres and another from 61 metres; nobody else would have even attempted those. “I started working with Delon Armitage when he was with England in 2011 and felt he could be a really fantastic kicker. Then I hooked up with him in Toulon and he has added a real dimension to Toulon’s game with those long shots he can put away [as against Munster in last season's Heineken Cup semi-final]. “If Delon had one out of one, you’d go ‘Wow, what a great kick’ and then he misses the one that’s 60 metres out, you can say he’s 0% kicker. I say that’s irrelevant. Where was the kick from, what were the conditions and, also, what was the time of the game? Mechanical functions and issues such as centre of gravity play an important part in Alred’s work with place-kickers, but he is not always quick to share that information with the players themselves. Often, less is more. Alred has a deep understanding of the elements of sports science involved in his job, but the likes of Ford, Sexton, Patchell and Jackson don’t need to know every detail. My awareness of what’s going on, particularly in terms of the power application coming from within the pillar to out, rather than out to in, is very much in the forefront of my mind when I’m looking at something. “I don’t necessarily communicate it, because I truly do believe now that there is a critical mass of information that actually leads to improvement. At that point, it’s a case of enough is enough and refine what you’re doing, rather than going into more and more detail. BT Sport will broadcast 35 live games from the European Champions Cup this season as part of the Setanta Sports Pack. You can sign up for the Setanta Sports Pack for just €1. Find out more at setanta.com. Email “Alred's rounded vision guides place-kicking of Sexton, Jackson, Ford and Patchell”. Feedback on “Alred's rounded vision guides place-kicking of Sexton, Jackson, Ford and Patchell”.